Claudio Monteverdi. Very Good. In very good packaging. 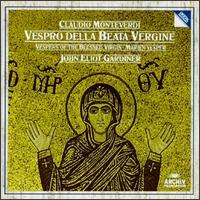 John Eliot Gardiner-Monteverdi: Vespers of the Blessed Virgin by John Eliot Gardiner. Like New. Music CD. 2 CD set. Not in original shrinkwrap. Discs & inserts in like new condition. Case has lost brand new shine. Stored in sealed plastic protection. In the event of a problem we guarantee full refund. 1990 Music CD.